I have spent many years ‘working’ on healing myself, more than twenty-five years now. I suffered from a severe depression on and off since I was a teen and most severely in my mid-twenties. I was a very sensitive child, anxious, often sick and hated crowds or big events. (check out the “Clairsentient” Page) Even the idea of going to a birthday party with friends would make me so anxious I’d often feel too sick to go. I never felt like I fit in anywhere but tried very hard to fit in, only to constantly fail at it, at least in my own mind. I often felt like an alien, even in my own family. After many years of the traditional medical route not being able to help me, my doctor told me I was treatment resistant and there was nothing he could do for me. At first I panicked not knowing there were other options. But then, freedom. Freedom to explore. Freedom to search deeper. Freedom to go outside my box of healing modalities and find what worked for me, for my body. This ending, was my beginning. I found alternative medicine. First I tried Acupuncture and Chinese Herbs, energy work, then hypnotherapy and on from there have tried everything I could possibly find and afford; homeopathy, reflexology, shamanic healing, energy healing, chiropractic, kinesiology, Bio-Feedback, EFT, Energy Psychology, and more. I spent years doing Past Life Regression with a psychic hypnotherapist with much success. And soon after decided to learn more about hypnotherapy myself. I went to school for two years to learn how to heal myself at the same time to maybe be able to help others as well. I truly felt and still do, that much of our healing must take place in the subconscious mind before we can heal physically. I was learning to heal the depression not only as a physical illness but also an emotional, mental and spiritual one as well. That I figured out was the part that Western Medicine was missing. They were only treating my physical body. And even then, they were only ‘band-aiding’ the symptoms, they weren’t actually healing the cause of the illness. The hypnotherapy was mainly targeting my mental and emotional body. What about the spiritual body? Natural Medicine? What a concept!? I made a great deal of progress when I was introduced to Naturopathy in 2007 while traveling the country with my family (www.rvgypsies) . A Naturopathic doctor is a doctor who uses only natural medicines to treat the whole body, physical, emotional, mental and spiritual. My body was so sensitive that I literally had severe side effects with every synthetic medicine doctors gave me. However, my body reacted beautifully to the natural medicines and homeopathy. I also needed individualized dosing methods since I didn’t “fit” into any of the doctors charts of what my body ‘should’ want. They didn’t seem to understand that I was unique and my body wanted different amounts of medicines than other people’s bodies. Hmmm, another weird concept, unique doses for unique people. Now that’s a piece of drift wood! 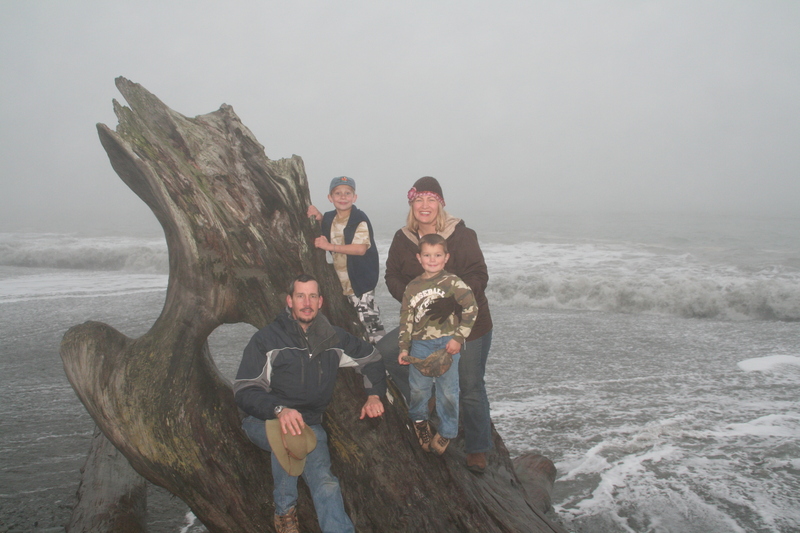 Dungeness Spit, Sequim, WA, Joss, her husband Robert and her two boys. During the healing process I was doing well enough on homeopathy that I married and had two children. I did my best to be a mom and wife as well as a person still struggling on and off with depression. There were hard times but there have been more great times with my amazing family. They are so patient with me. The healing process is a journey. Quite often for some, a long journey. Sometimes people don’t understand that. We are so used to being able to take a pill and get better quickly. But, what happens if those pills don’t work for you, if nothing that you know of works for you. What do you do then. You don’t stop living, but you don’t stop searching either. Luckily I have spirit support, I have a totem animal of a badger, a voracious healer, who helps to keep me moving forward, searching, constantly trying new methods and finding out what works best for me. Giving up is just not an option, not with badger by my side. I have to be well for myself, my family and for my passion for sharing energy with others. Through this search I found spirituality, My God, a God of Love and Light that made sense to me. Through this search I found better physical health through my medicine, natural medicine, that works for me. And through this search I found ENERGY! A mentor taught me to FEEL the energy with my hands. For the first time ever in my life there was a MAGICAL INVISIBLE WORLD right here on earth. I was astounded and thoroughly excited. It opened up my mind to a whole new way of being, living and believing. Divine Energy being the glue that holds all these things together. Energy, being the energy of ALL THAT IS, being all-pervasive in our lives, our earth, our universe. I had to know more. I had to learn everything I could about it. That search led me to REIKI! Joss does Reiki on her oldest son’s leg when he injured it on the spit. You never know where you’ll be when you use your Reiki abilities. Click for a larger picture. 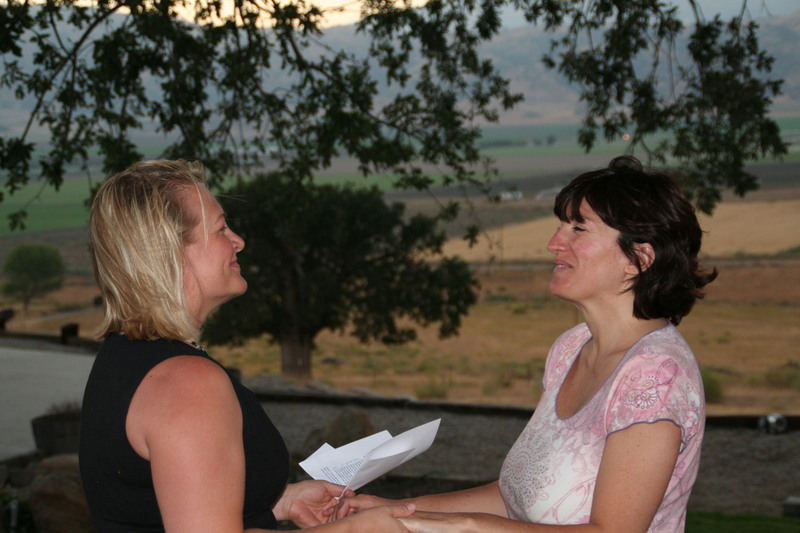 I fell in love with Reiki during my very first class and the love affair continues to this day. During my search for a “cure” to depression I had many days when I felt quite useless. I knew this was not how I was supposed to spend this life but I wasn’t clear on HOW I was supposed to spend it. So I prayed. I prayed a lot. I had never prayed in my life prior, not being raised with any spiritual beliefs. But, I had recently found my Divine so I prayed to my Divine Source of All-That-Is to give me a gift so I could help others. I prayed this same prayer for years during the time of healing myself and raising my kids. One day, my guides tole me to take a Reiki class. I followed their recommendation and took a Reiki class. I didn’t even know it then, but my prayers were answered on that day. I was shown my talent, my gift in this life. I right away was able to run a lot of energy. The “sensitivities” that I’d had all my life that had felt so much like a curse, suddenly turned into beautiful psychic gifts during healing sessions. (Clairsentient Page) Friends and clients I was working on soon started feeling better and reporting back that the information I’d gotten for them during healing sessions was accurate and “right on” as they would say. I was amazed and astounded but mainly I was extremely grateful! I had finally found a place where I fit in. Where I felt like me. Robert and I on the beach in CA before we took our big journey around the country. A Life has many journeys within it. When my boys were still not in school yet, my husbands parents both passed away. Robert’s mom had been in a vegetative state for almost nine years from a heart issue. The stress of this had taken its toll on his father and he went to the light soon after his wife. There was a year of major grieving and transition for the family. Soon after we needed a big change. We had talked for years about moving out of the L.A. suburbs but wouldn’t leave as long as his parents were alive and needed us close. But someday we knew we would find our own place. The traffic, crowds, smog and overactivity of the L.A., Orange County lifestyle was too much for me. It wasn’t good for my health and seeing already our kids being as sensitive as their mom, it wouldn’t be good for their health either. Robert came up with the idea of traveling the country in a trailer to search the whole country for a new place to live. After much crazy debating, we decided not to live by fear and went for it. We rented out our house, bought a truck and trailer, packed up the family and traveled for 14 months looking for our perfect place to live. The biggest lesson we learned on this trip with two young kids, a wife/mom with depression, a dog, two cats and a really big trailer in tow was one of trust and faith. When we allowed God to direct our trip and just rolled with the flow, everything went great and was quite magical. When we tried to control the trip, everything would fall apart. We quickly learned that we were not in charge and just allowed the trip to unfold on its own. (go to our website about the trip with photos) That is how we found one of the most beautiful places on earth, the Olympic Peninsula, in Washington State. My boys and I on the Dungeness Spit in Sequim our first visit. Now we live in Sequim, WA. 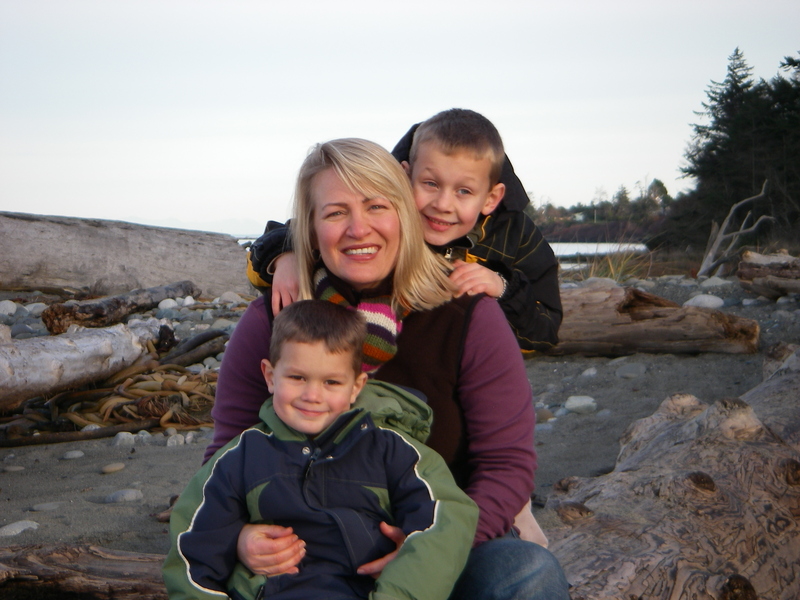 (More on home page about Sequim) I am a soccer/baseball/golf mom to two amazing boys, a wife, a housekeeper and cook (not a great one but I’m cheap!) and YES, a Psychic Healer! (A lot like the show Medium, but with boys!) Most people in town don’t know what I do even though it’s a small town. I look like a soccer mom, act like a soccer mom, so I must be a soccer mom, right!? We’ll just let them think that. When people are ready to know what I do, they ask. I wait. I’ve learned through the years to be patient. It’s all in Divine’s time, not ours. When people need me, they find me. That’s why when Divine told me to make a website, and write it and design it myself, I didn’t question it, I did it. And, here it is. For all to read if they find it. If you’ve read this long story this far there is certainly a reason. Thank you for reading my thoughts and words and hopefully you felt a connection to my story. If you feel I am the healer or reader you’d like to work with and are ready for your own healing journey, then give me a call and lets talk. I like to get to know people and see if it’s a good fit on both sides. I continue the process of healing myself but have gotten to a point in life where I can help others too. I’m now able to see the depression as a HUGE GIFT from GOD. It got me back on my path, a path I never would have even thought of myself. For that I am eternally grateful. Divine always has a plan for us. All we have to do is TRUST and LISTEN! I learned how, now I can help you with that too. Thank you for sharing this insight into your healing process, Joss…always a pleasure to “hear” your truths! Thanks Pat, I think everyone had a story. Knowing others’ helps us understand each other better. Thanks for reading. Thank you for sharing, Josslyn. I found your blog via your interview with Momlogic about your RV adventure…I enjoyed reading your interview, and I can personally relate to your past sense of unsettledness while your family was living in California. We are seriously considering embarking on the same adventure, and are in the beginning processes of selling everything and will hopefully be ready to purchase an RV this summer! We have been to the Olympic peninsula (2002), staying for a couple of days in Port Townsend. 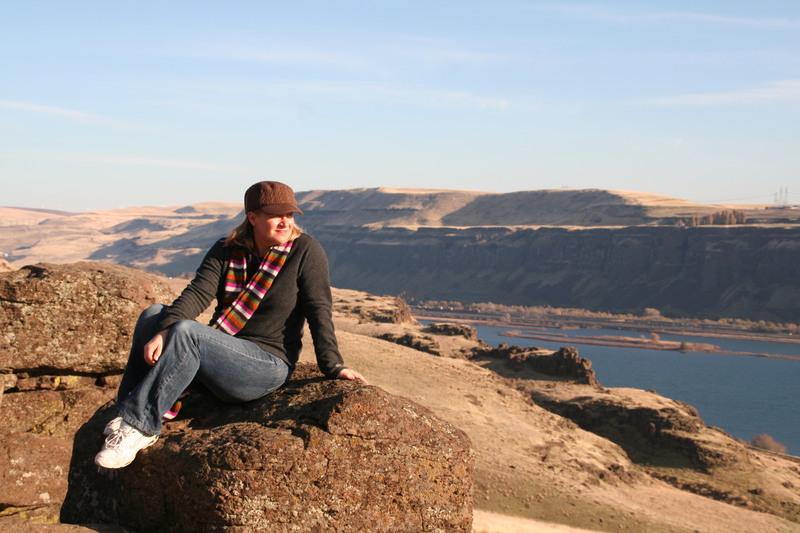 I agree, it’s a magical place, and we long to experience the WA/OR coast again as we are now living in our home state of IN, and have been for the last ten years after having spent three years in OR where my husband attended graduate school. I have actually looked at Sequim before whilst researching communities on the peninsula which receive the most sunlight, and I understand yours is tops in this category. Thank you again for your unfettered voice: I found it inspiring. Hi I came across your website. can you tell me what the grey looking fish w teeth/aircraft means? I saw it in a dream or vision 2 years ago.